Vitamin C (Ascorbic acid) under a microscope! Vitamin C, also known as ascorbic acid and L-ascorbic acid, is a vitamin found in food and used as a dietary supplement. As a supplement it is used to treat and prevent scurvy. 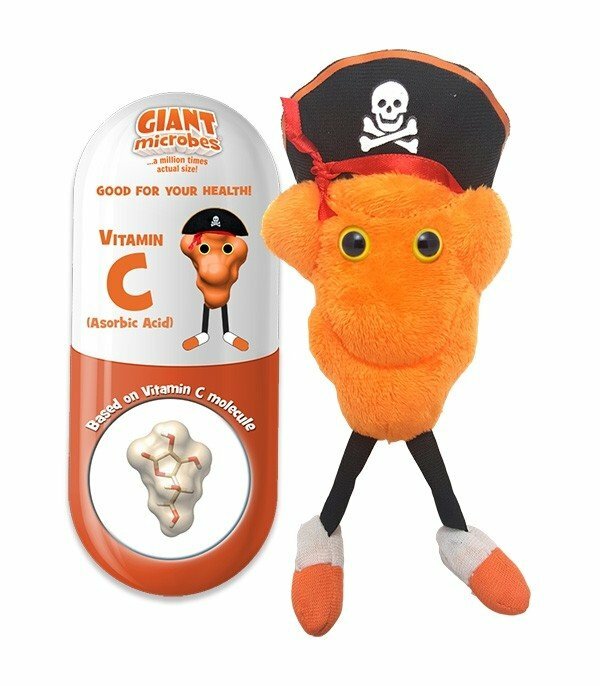 While no evidence supports using Vitamin C to prevent the common cold, our little guy is the perfect remedy! 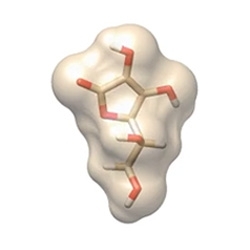 Our Vitamin C is based on the shape of the actual molecule! Vitamin C is critical in the reactions that form the protein collagen. Bones, muscles, skin and arteries are made of collagen. 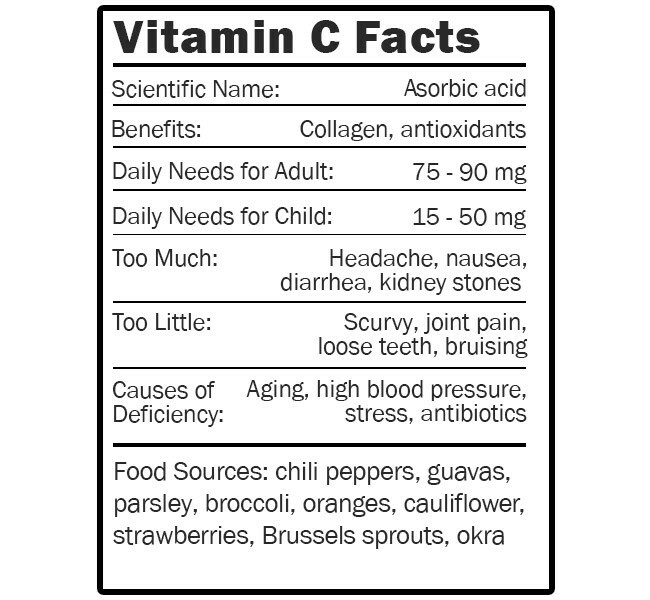 C is also an antioxidant, so it helps fight germs and infections. Do you know what disease can be cured by orange juice and have you ever wondered why British sailors are called “limeys”? Throughout history sailors on long voyages lost their teeth, developed sores, got weak and often died. This was scurvy. It was such a huge problem that ship owners expected a 50% death rate from scurvy on major voyages. 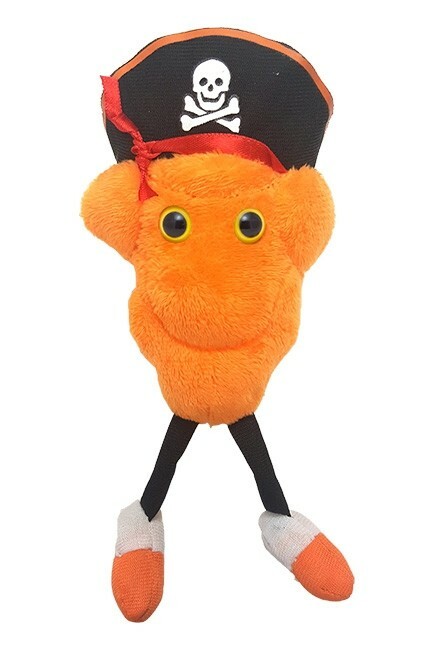 Scurvy killed more people at sea than storms, shipwrecks and pirates. It killed lots of pirates too! People knew that eating fresh food helped, but no one was sure why. In the 1740s a doctor gave sick sailors citrus fruits and they recovered quickly. From then on, British ships carried limes or lime juice. It wasn’t until 1932 that a scientist discovered that vitamin C was the magic fruit ingredient that averted scurvy. Simply eating citrus fruits, tomatoes, peppers, and berries does not guarantee you’re getting all the vitamin C these foods once contained. This is because time destroys the vitamin, and foods lose C as they get older. A newly dug potato has a lot more C than one stored for the winter. Since C is water soluble, fruits and vegetables can also lose it when cooked in water. So just remember: A fresh orange a day keeps your teeth on display!